In general, treatment is needed for gallstones in the gallbladder that cause recurrent episodes of abdominal pain (known as biliary colic). Gallstones that do not cause any symptoms (so-called ‘silent’ stones) generally do not require any treatment. However, some people with silent stones who are at high risk of gallstone complications, such as those with liver cirrhosis, may benefit from treatment. Surgery to remove the gallbladder is the most common treatment for symptomatic gallstones. ‘Cholecystectomy’ – the term that doctors use for gallbladder removal – can be performed through open surgery or ‘keyhole’ laparoscopic surgery. Because your gallbladder is not an essential organ, it can be removed with few adverse effects. An open cholecystectomy is a procedure where the gallbladder is removed through a large single incision in the abdomen. Open surgery is generally only used in people who are not suitable candidates for laparoscopic surgery. Laparoscopic cholecystectomy, which is a type of ‘keyhole’ surgery, involves several small incisions being made in the abdominal wall through which very fine instruments and a specialised tiny video camera are inserted. The gallbladder is then removed under video surveillance and taken out of the body through one of the incisions. Laparoscopic surgery involves less post-operative pain, less scarring and allows a speedier recovery time compared with open surgery. Hospitalisation is generally 1-2 days, rather than the 5-8 days associated with open cholecystectomy. Sometimes surgeons may have to abandon the laparoscopic method and switch to open surgery if they have difficulties during the procedure. As with any surgery, there are some risks, but it is a relatively safe procedure. Some people have more frequent bowel movements or diarrhoea following gallbladder removal, but these symptoms usually lessen over time. There are various forms of non-surgical treatment available, one of which is the use of oral medication to dissolve gallstones. However, this treatment is only effective in the treatment of small, non-calcified gallstones and they have to be cholesterol gallstones. It is used only in rare circumstances such as in people for whom surgery is not an option. With oral dissolution therapy, medication is taken by mouth to reduce the amount of cholesterol in the bile and to gradually dissolve cholesterol-containing stones. This form of treatment does not offer a particularly effective solution, as less than 50 per cent of stones are dissolved, and 50 per cent of these commonly recur after the medication has been stopped. It can take months to years for the stones to dissolve. Extracorporeal shockwave lithotripsy (ESWL) is another form of non-surgical intervention. It involves the generation of shock waves outside the body. Ultrasound is used to locate the gallstones, and the shock waves are directed at them until they shatter. Following lithotripsy, most people need to take medication to dissolve the fragments. This treatment is generally only used for single, small gallstones, because it is not effective for multiple or large stones. As with any treatment that leaves the gallbladder in place, there is a risk of recurrent stones. Stones that are lodged in the bile duct can cause serious problems and need to be removed either surgically, or by means of an endoscope (a flexible instrument that is passed down through the gastrointestinal tract). If your doctor suspects a gallstone may be lodged in the bile duct and it cannot be detected using ultrasound, they may request an investigation called endoscopic retrograde cholangiopancreatography (ERCP). 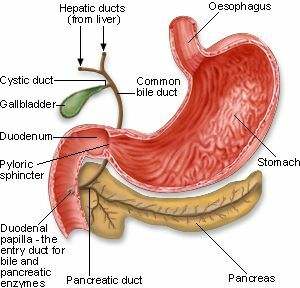 ERCP involves looking at the bile duct through a small flexible tube called an endoscope, which is inserted into the mouth and directed carefully through the oesophagus and stomach, down into the duodenum (where the opening to the bile duct can be seen). A dye is then injected through the tube and into the bile duct and X-ray images taken to demonstrate any blockages that may be present. If gallstones are found to be blocking the bile ducts, they can be removed during the ERCP procedure. This involves passing a small instrument through the endoscope and making a small cut in the lower part of the bile duct (called endoscopic sphincterotomy). This will allow the doctor to remove stones by catching them in a tiny basket and removing them through the endoscope. Alternatively, with bile duct entrance widened by the cutting, the stones are freed up to pass into the small intestine, from where they will continue through the digestive system and exit the body. 1. Gastroeneterological Society of Australia (GESA); Digestive Health Foundation (DHF). Information about gallstones, Third Edition 2010. http://www.gesa.org.au/files/editor_upload/File/Consumer%20Brochures/2014/Gallstones.pdf (accessed Aug 2015). 2. MayoClinic. Gallstones (updated 25 Jul 2013). http://www.mayoclinic.org/diseases-conditions/gallstones/basics/symptoms/con-20020461 (accessed Aug 2015). 3. National Institute of Diabetes and Digestive and Kidney Diseases (NIDDK). Gallstones (updated 27 Nov 2013). http://www.niddk.nih.gov/health-information/health-topics/digestive-diseases/gallstones/Pages/facts.aspx (accessed Aug 2015).